I purged my closet last week ((spring cleaning, anyone?)) and am having another shop my closet sale ((link here)) when we get back from Arizona. I've tried all those websites that you sell gently used clothing on and I've definitely been to my fair share of consignment stores, but have had the very best luck selling my purged items on instagram. Every time I have one of these sales, I get emails asking the best way to sell items, so I thought I would share a few tips I've learned along the way! 1. Take great photos. You can definitely use your phone, but style your items rather than just laying them on the bed. Some ideas for this: Use a dress form. Hang them on a nice wooden hanger on a neutral wall. Hang them on a hanger on the front of a door. Whatever you do, don't show things on the floor (especially carpet!). If you were in a store and items were on the ground, would you pick it up to try it on? Nope. If it's a scarf, don't just throw it on the bed. Tie it on a dress form, yourself, or tie in an attractive way on a neutral surface. Same with jewelry. 2. Pricing - An average item at a resale shop gets you $3-5 ((based off of experience)). Start there and go up a bit, based on what it's worth to you. You are doing the work to resell, so start low, but fair. If it's a shirt from Target - don't charge even 50% of what you paid. It's target. I start around $3-5 for Target items. If it's a high quality dress from Anthro - check ebay for what they're going for. I start my designer denim at more than 50% of retail price because I know they are gently worn, in great condition and will last for years. If it's a pair of jeans from Old Navy, I'll usually just take them to Goodwill or sell them for $5-10. You decide what it's worth to you, but if you start too high you can't get your feelings hurt if people don't bid or purchase. Just lower them a bit and try again. 3. CLEAN YOUR CLOTHES. Dry clean them, wash them yourself, whatever. Bonus? Steam or toss in the dryer before you fold and package items. Nothing is worse than getting an item second-hand that still has "sit marks" on a skirt or deodorant marks on a blouse - it feels dirty and customers shouldn't have to wash their clothes upon receiving them. 4. Give style ideas in your description. Is your dress versatile enough to be worn year around? Tell us how to style it through all seasons. Does it fit kind of boxy, but you wear it with a skinny belt? Let us know that, or even style it on a form using said belt ((and let us know if the belt is included or not!)). -If someone finds my sale on the last day, they aren't SOL if they want something. They can outbit the current bidder if they really want an item. It's so frustrating to not be on social media for a day and find an item you LOVE on someone's closet sale only to find it was snatched up too soon. -Closet sales take a TON of time. steaming/ironing/photographing/invoicing/sending reminder invoices/packaging items/taking packages to the post office with an 11 month old is just part of the process. I want my efforts to be worth it. Auction style helps me to make $5-10 more per item than if I took it to a resale/consignment shop. 7. Charge enough for shipping. I usually go for $5 and $1 per extra item. If it's a heavy item, such as denim or a sweater, don't feel bad charging more. You can always refund if it's too much of an overage. Charge more for shipping for shoes ((Extra note: Unless shoes are in perfect, pretty much new condition - no one wants them)). They are heavier and I lose money almost every time because I forget to charge more! PUT SHIPPING CHARGES IN EACH LISTING. Customers don't always read the "info before the sale photo" - this prevents people from changing their minds because they "didn't realize it didn't include shipping." And speaking of shipping, ALWAYS ALWAYS ALWAYS get tracking and insurance if you can. Build it into the shipping cost. I had someone file a charge back on paypal even though the PO obviously lost it. The tracking was from the USPS end and I didn't purchase extra tracking, so I lost $70 and a pair of my favorite AGs. Plus, when I checked back in with the sorting center, they had found it and said they delivered it (months later) but the gal wouldn't respond to any of my emails. People aren't always honest, so protect yourselves. 8. ((This tip is for bloggers.)) Try not to sell a ton of things you received for free from boutiques or handmade shops for blogging about them. If it is literally sitting and gathering dust in your closet, I don't see a ton of harm in it as long as you plugged it in an outfit post or instagram like you said you would. Don't get greedy with it though. Those items should be passed on to a good home versus making a ton of profit from it. 9. Show the items in use. If you have them, post photos with the products on. This helps customers see how things fit. Make a collage if need be of the item on a hanger, on you, and close ups of the print if you want. 10. Package nicely. I'll be honest, I used to just throw items in an envelope and call it a day. Now, I wrap in tissue or a plastic bag. It's a small thing that helps protect the clothing and makes it a little extra fun for your customers to open. 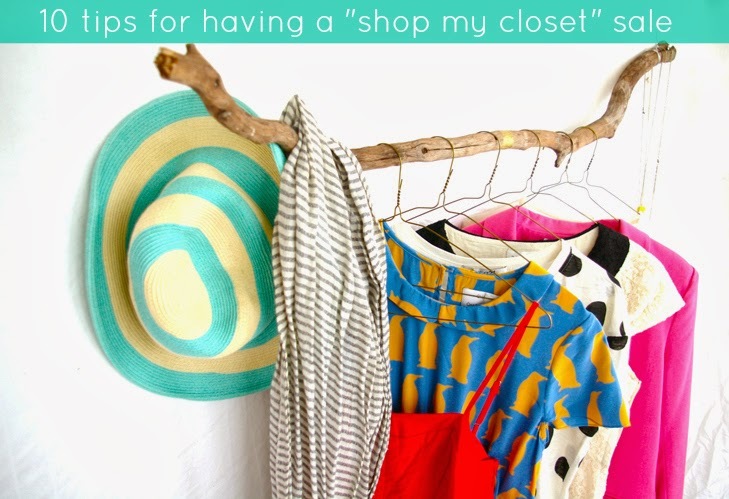 BONUS: Usually the purpose of a closet sale is to declutter and get rid of excess. If items don't sell, take them to goodwill, a resale shop or give to a friend. Don't keep them or it defeats the purpose! I hope this helps you get rid of some items during your upcoming spring cleaning and send them off to good homes. Closet sales can be great, but are a lot of work! I have just been tossing around the idea to "open a closet" for my blog so this post is coming at the perfect time. Thanks for the tips! Thank you so much for sharing this! I've been thinking about doing this and these are great tips! What fabulous tips!!! Thanks so much! Great tips and I love your branch hanger! I think a great follow-up to this post would be a post on tips to successfully purging your closet. I always start with great intentions and then don't get very far becuase I think "but I MIGHT wear that again someday..."
Hi Kim, just wanted to see if you were going to have your closet sale soon? Any date set? Often, stores say they're suspending price-match guarantees during the Black Friday weekend, but you should ask for one anyway. After all, these are supposed to be "the lowest prices of the year!" To be safe, also check your local chain's return and exchange policies to make sure that they aren't different for a Black Friday special. Sometimes, Black Friday sales are final, meaning the item can't be returned. Other items may have a shortened return or exchange policy, or one where you can get only a store credit and not a refund. Also, make sure the store won't charge a restocking fee for a returned item. Whats the recommended (and most affordable) type of shipping to use for closet sales?